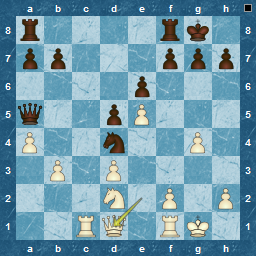 I rarely have a chance to play this sort of move, probably because my games either end earlier, or the endganes are much closer. The game is lost for Black, but gamely, he plays on, bringing the king closer, and finally, blocking the f-pawn with the knight, and leaving the White Rook blocking his own g-pawn. Job done ? 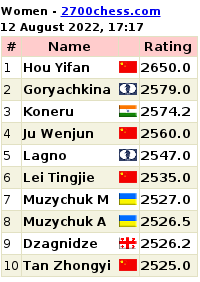 Some sort of parity ? Reviewing this blitz game, I saw a terrible miss from me ( as Black ). 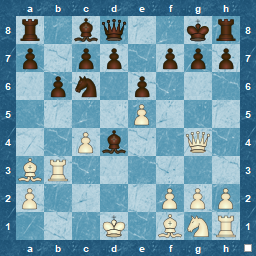 So obvious in retrospect, and I am sure I would have seen it during a longer time frame, but my focus was on the pawn at d3. 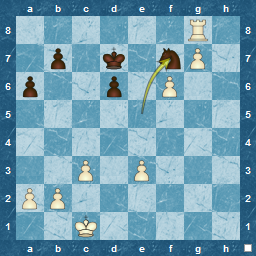 In game terms, I had been in a 'repeating-moves position' a few moves previously, and had decided I didn't want to risk a draw (at move 20), so had exchanged a Rook on the d-file instead. I calculated that Qxa5 was terminal for Black ( and for that matter fairly obvious being trivial to work through ). I also calculated a few moves on the various 23...Bxe5 lines, and noted that Rd6 looked interesting , although I didn't go so many moves down that path. Overall, I thought it gave Black 'food for thought' and a more imbalanced game afterwards, ie moving away from the draw. 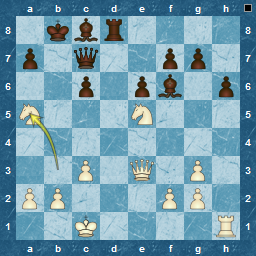 What would be your move as Black ? Completely unrelated, but I always liked the song linked to below, especially after "discussing it" on a local train between Darlington and Newcastle sometime in the 70s. Hey, I was a student, that's what you did ! Probably why it came into my head when trying to come up with a title for the post. !